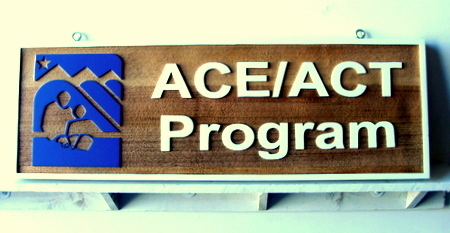 This unique sandblasted Cedar wood sign for the "ACE/ACT Program" is painted and the background is dark stained wood. It has raised lettering , art, and a border, and the interior background of the sign was sandblasted. Brown, deep blue and ivory colors are effective here. It can be mounted on a wall or hung from a wood or iron hanger/scroll bracket out from the wall or a post.